On The 2nd of March a special Eesale Sawaab Programme for Shaheede Namoose Rislat Mumtaz Hussain Qadri was held at Masjid Sayyaduna Ghouse Azam Darul Uloom Complex after Maghrib Salaah. A large number of prominent Ullama, Mashaikh, Quraah & Naat Khwans from all around Gauteng, as well as other parts of South Africa, attended this united spiritual gathering. Representatives from Dawate Islami, Savri Chisti, Sultan Bahu Centre, Pretoria Muslim Trust and a large number of Madaris and Masajid were in attendance. 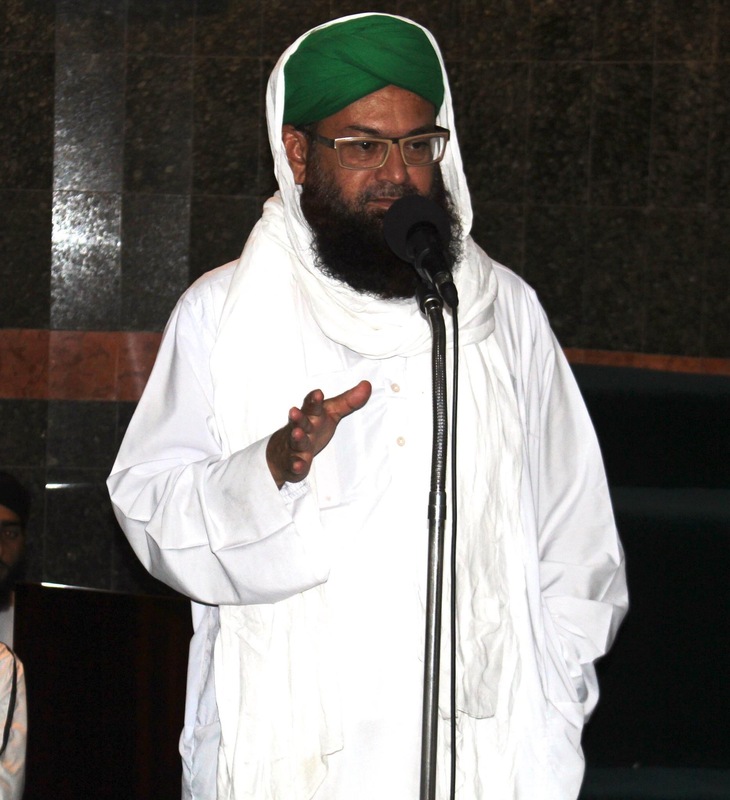 Moulana sarfaraaz (an educator at the Darul Uloom) took the position of master of ceremony. 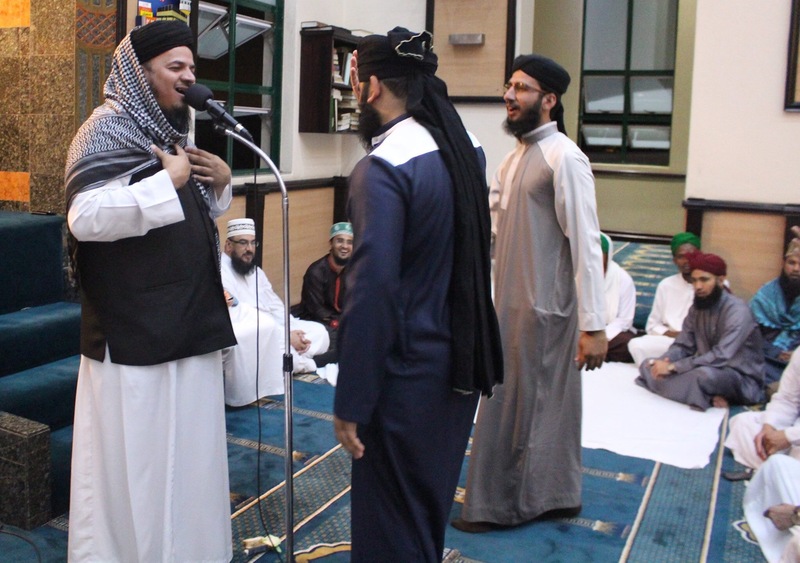 He called upon Qari Zahid Ahmad Zahidi (Jamia Rizvia, Lenasia) who praised the holy prophet صلى الله عليه وسلم in his unique manner.the crowd was electrified with his rendition. Thereafter Moulana Moosa Raza (Madressah Imam Ahmed Raza, Laudium) presented a few couplets of Naat and Manqabat of Ghause Azam. He also took the opportunity to thank Darul Uloom for inviting him. Moulana Mehboob ur Rehman (an educator at Darul Uloom) read in the praise of shaheede namoose risaalat ghazi Mumtaz Hussain Qadri. Moulana Sarfaraaz Rahmatullah then called upon Moulana Syed Yusuf (Sabiri Chisti, Lenasia) to deliver a short discourse. Moulana Yusuf instilled the love of Rasul Ullah صلى الله عليه و آله وسلم‎ in the hearts of all listeners with a vivid description of the love that Ghazi Mumtaz had for Allah’s most beloved. He mentioned how Shaheede Namoose Risalat Ghazi Mumtaz Hussain Qadri sacrificed his life and how his love for Rasoolallah elevated his status in this world and the hereafter. He also mentioned that Mumtaz Qadri is a true Aashiq (lover) of the holy prophet صلى الله عليه وسلم and has left a path for us to follow. Thereafter Mufti Abdul Nabi Hamidi (Dawate Islami) was called to the mic. His eyes expressed the grief he had on the loss of such an Aashiq of Rasoolallah. He explained that the Pakistani government, which was meant to uphold Islamic Shariah, has left the Shariah and acted in contrast to its teaching. Hanging this great man has been it’s biggest mistake. He said it felt as if the story of Karbala had repeated itself -but this time Mumtaz Qadri had been in th place of Imam Hussain and the Pakistani athoroties being in the place of the Yazido army, hungry for power money and the chair which they sit upon. The final guest speaker, Moulana Mukadam, was then called upon the mic. Moulana Mukadam (Al Ghazali College) expressed joy that all the Ullama and dignitaries of this community have come together on this occasion and we should continue to share the stage together putting aside our minuet differences. He mentioned that Shaheede Namoose Risalat Ghazi Mumtaz Hussain Qadri is not a normal person but rather he is the Ghazi of this era. The principal of Darul Uloom Pretoria The Mufti Akbar Hazarvi passed the vote of thanks and mentioned that the Ulama and dignitaries seated have come here at there own expense just to show their love for Shaheede Namoose Risalat Ghazi Mumtaz Hussain Qadri. He also agreed upon the saying of Moulana Mukadam and said that we should stand united as it is a famous saying “United we stand,devided we fall”. The crowd stood in the respect of the holy prophet صلى الله عليه وسلم as the Salaami was lead by Akhkaq Saidi and Qari Khaleel. The final dua was made by Moulana Noirie (Maqsoodul Uloom, Potchefstroom). 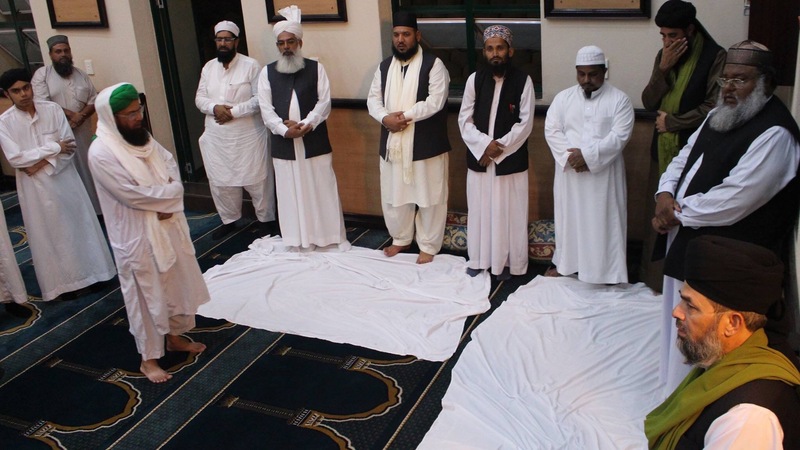 The Azan for Esha was sounded, Esha Salaah was performed and the Deputy principal of Darul Uloom Hafiz Ismail Hazarvi and Moulana Mukadam lead in the Final Dua.